Bryan Hulbert - TULSA, Okla. (January 19, 2019) A finish for the ages, Kyle Larson looked to have his first Lucas Oil Chili Bowl Nationals presented by General Tire in hand, but with a furious run as the leaders worked into traffic, Christopher Bell found the hole on the low line entering turn one on the white flag lap to win his third Golden Driller in a row aboard the iRacing/Keith Kunz Motorsports No. 71w. 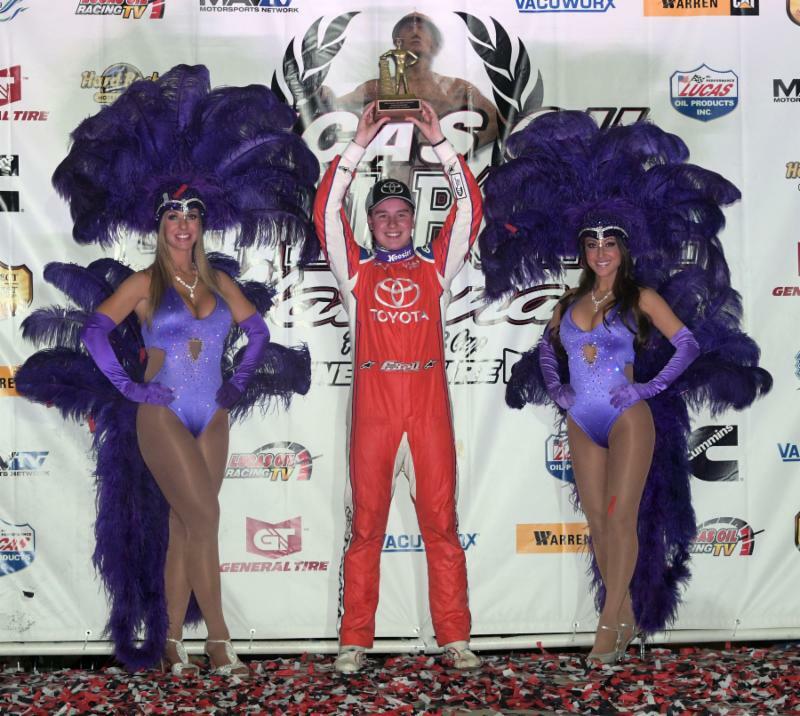 "Never in my wildest dreams did I think I would be able to win the Chili Bowl. To do it three straight times is just unbelievable, but man, I don't even care about three-straight. What about that race? I don't think I've ever really been a part of a last lap race like that, so I'm just glad that thing came out in the end," stated Bell who earned Keith Kunz his eighth Golden Driller as a car owner. "To win like I did there, it's something I'm going to cherish the rest of my life." Taking several shots at the start, the fourth time proved the winner with Logan Seavey taking off with the race lead. Larson in tow with Justin Grant and Christopher Bell giving chase, the line began moving as the race worked past the 14th circuit. Starting to diamond corners with traffic in the mix on Lap 17, Larson was glued to Seavey's back bumper. Getting the run on Lap 20, Larson's run to the lead came the following lap with a low side pass off the fourth turn. Getting the run on Logan Seavey for the runner up spot working Lap 33, the caution negated the pass by Bell. Retaking the spot-on Lap 34, Bell was on Larson for the lead the following lap before the caution on Lap 35. Swapping lines top to bottom on the restart, Larson began building some distance over Bell. Finding traffic on Lap 48, Larson's advantage came under fire as slower traffic played to Bell's advantage. Racing to the final two laps, Bell was there. Looking for room to pass, the opportunity came as the pair raced past the white flag. Tapping tires through the first two turns as Kyle slipped off the bottom, Larson and Bell came together again through the third and fourth turn with neither wanting to give in. Freeing himself from Larson, Bell was able grab the win by 0.350 seconds. The victory puts Bell in an elite class with Kevin Swindell as the only two drivers to win three consecutive Chili Bowl titles. Swindell still stands as the only one to go four for four. Falling back to fourth on Lap 23, Justin Grant retook the spot on Lap 36, and held on for the show position in the NOS Energy Drink No. 4a. Racing from seventh, Oklahoma's Brady Bacon crossed fourth with Zach Daum moving up three spots to round out the top-five. Involved in an earlier caution, Tyler Courtney ended up the night's Hard Charger as the Indiana shoe was able rebound from the tail to sixth. Brad Sweet in seventh was followed by C.J. Leary, Logan Seavey, and Tanner Thorson. For the 33rd annual Lucas Oil Chili Bowl Nationals presented by General Tire, a total of 350 drivers took part in the 2019 event. The week's flip count reached 75 with the final car over being Christopher Bell. Attempting to rip victory donuts, Bell banked off the cushion and sent the car over. All drivers getting upside down were able to walk away. The 34th annual Lucas Oil Chili Bowl Nationals presented by General Tire takes place January 13-18, 2020 at the River Spirit Expo Center in Tulsa, Okla. Reserved Seat tickets go on sale on Wednesday, March 6, 2019. Ticket holders will receive a notice in the mail. All are encouraged to sign up for email notifications through the Chili Bowl website. B Feature 1 (20 Laps): 1. 1R-Brad Sweet, ; 2. 47X-Danny Stratton, ; 3. 8J-Jonathan Beason, ; 4. 17S-Ricky Stenhouse Jr, ; 5. 57C-Cole Bodine, ; 6. 87-Colby Copeland, ; 7. 4D-Robert Dalby, ; 8. 21B-Chase Briscoe, ; 9. 11A-Andrew Felker, ; 10. 08-Cannon McIntosh, ; 11. 52-Blake Hahn, ; 12. 17R-Alex Schutte, ; 13. 1B-Travis Rilat, ; 14. 5G-Grady Chandler, ; 15. 55D-Nick Drake, ; 16. (DNF) 15H-Sam Hafertepe Jr, ; 17. (DNF) 32D-Casey Shuman, ; 18. (DNF) 99P-Dillon Welch, ; 19. (DNF) 17A-Austin Brown, ; 20. (DNF) 36-Dave Darland, ***Darland disqualified for ignoring orders track officials after being the cause of a caution and unsportsmanlike conduct. Kevin Studley J-Features: Top 6 advance to the corresponding I-Feature.